Pistachio nuts contain healthy and heart-protective unsaturated fats and provide many important vitamins and minerals, such as copper, manganese, phosphorus, vitamin B-6 and thiamin. Originating from Iran, this nut is often consumed on its own, either roasted or salted, or in ice cream, baklava and biscotti. Although pistachio nuts are relatively healthful, eating too many could have side effects on your weight, blood pressure and gastrointestinal tract. A serving of nuts usually is 1 oz. In the case of pistachio nuts, this serving consists of about 49 kernels. 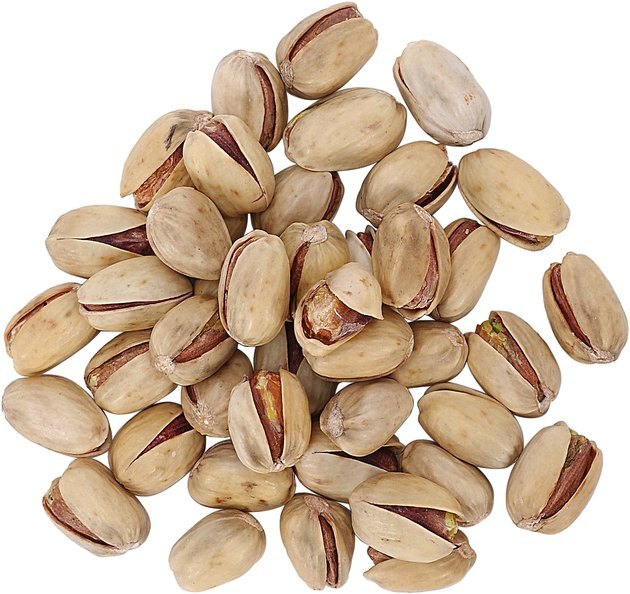 A serving of raw or dry roasted pistachios provides about 160 calories, 5.8 to 5.9 g of protein, 12.7 to 12.9 g of fat, 7.8 to 8.3 g of carbohydrates and 2.8 to 2.9 g of fiber. The high protein and fiber content makes pistachio nuts a satisfying and convenient snack for many people. However, if you go nuts when eating pistachios and eat a handful at a time, you could gain weight. For example, if you eat a full cup of pistachio nuts, you could consume close to 700 calories. Because a surplus of 3,500 calories is the equivalent of a pound of extra fat on your body, eating 1/2 cup to 1 cup of pistachio nuts every day could result in a 0.7 to 1.4 lb. weight gain per week. Eating too much of anything is never good, and the side effects usually include a higher fat percentage and larger waist circumference. Natural pistachio nuts have very low levels of sodium, or about 0 to 2 mg per 1-oz. serving. However, roasted pistachios seasoned with salt can contain up to 121 mg of sodium per serving, according to the USDA National Nutrient Database, which is not so bad if you can control your serving size. However, eating 1/2 cup to 1 cup of salted pistachio nuts could increase your sodium intake by 263 to 526 mg, increasing your blood pressure as a side effect. The American Heart Association recommends limiting your sodium intake to keep your blood pressure under control and your heart healthy. Pistachio nuts can have gastrointestinal side effects in some people who react to a compound called fructans. Fructans are not dangerous, but they can bother the digestive system, leading to bloating, diarrhea, constipation, flatulence and abdominal pain. The degree of your gastrointestinal symptoms, if you are intolerant to fructans, will depend on the amount of pistachios you consumed. The more nuts, the worse your symptoms can be. Can Nuts Affect Blood Sugar?